The Chiefs picked up another win last week in their week #4 matchup with the Washington Redskins. They won the game 29-20. The offense played a big part in the success with 429 total yards. The Chiefs are the only undefeated team after the first four weeks of the season. 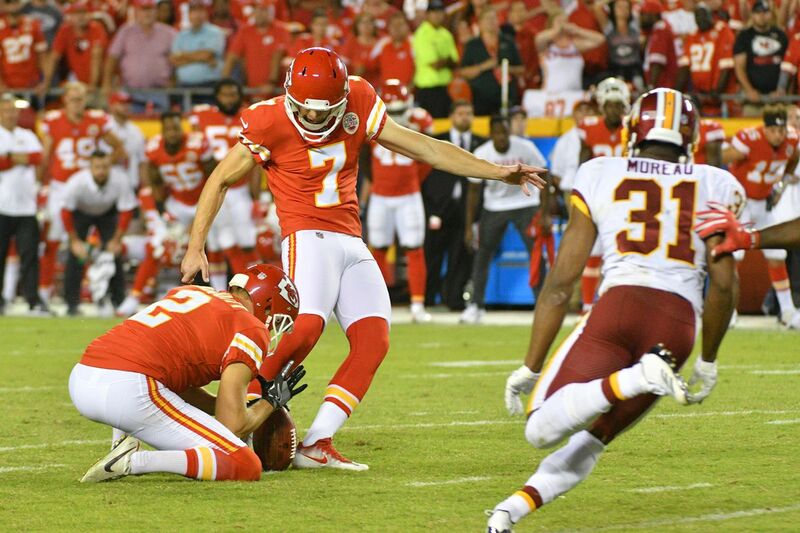 Rookie kicker Harrison Butker made his debut last week. He went 3 for 4 including the 43-yard game winner. The Chiefs picked up Butker from the Carolina Panthers practice squad to replace Cairo Santos who was injured in week #3. The Chiefs waived Santos when they signed Butker. Kareem Hunt continues to be a key factor in the Chiefs offense. He has 504 rushing yards through four games, 140 more than the next closest rusher. Hunt has 659 total yards and six total touchdowns so far this season. Hunt has been one of the most dynamic players in the NFL in the first four games. Travis Kelce also had a strong performance last week. He had 111 yards receiving and one touchdown. Kelce has 255 yards and two touchdowns this season. He is second on the team in receiving yards. Kelce has had two 100+ receiving games this season and should be an offensive threat for the Chiefs. Guard Laurent Duvernay-Tardif avoided a serious injury in the game last week. He left in the first quarter and did not return after he suffered a knee injury. The injury was a sprain and he is expected to be day-to-day. The Chiefs are still first in the AFC West standings. The Denver Broncos beat the Oakland Raiders last week. The win moved the Broncos into second and the Raiders into third in the division. The Chargers continue to struggle this season with a record of 0-4. The Chiefs next divisional match-up will be week #7 when they face the Raiders in Oakland on Thursday night. This week the Chiefs will face the Houston Texans on the road on Sunday night. The Texans are 2-2 this season. Last week they beat the Tennessee Titans 57-14. Rookie quarterback Deshaun Watson has 709 yards and six touchdowns in his three starts this season. The Texans defense has also been strong this season. They have given up the fifth fewest yards per game. It should be an interesting match-up on Sunday night between two potential AFC playoff teams. The Chiefs also held down the #1 ranking on our Top Ten Thursday NFL article. Will they continue to hold that spot? Or will another team be able to claim it? Find out who we think the top ten NFL teams are by reading our weekly article!